I first ran into the idea of zombie firms--and the need to kill them--back in the late 1980s, when the US savings and loan industry was melting down. Here's an explanation from that time from Edward Kane ("The High Cost of Incompletely Funding the FSLIC Shortage of Explicit Capital." Journal of Economic Perspectives, 1989, 3:4, 31-47). "The events of the early 1980s broke the savings and loan industry into two divergent parts: the living and the living dead. This terminology portrays firms whose enterprise-contributed capital has been lost as soulless "zombie" institutions. 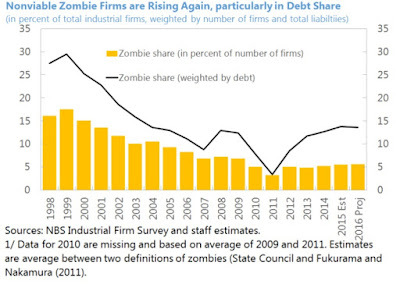 ... Zombie firms now constitute roughly 25 percent of the FSLIC-insured thrift industry. As in a George Romero zombie movie, capital forbearance brings dead firms back to a malefic form of quasi-life in which they attack the living, turning the prey they feed on into zombies, too. In a kind of Gresham's Law scenario (an analogy suggested by Joseph Stiglitz), "bad" zombie thrifts tend to drive out healthy competition. Zombie institutions do this by sucking deposits away from their competitors by offering high interest rates and by bidding down loan rates on high-risk projects. This squeezes profit margins and the proliferation of weak competitors and risky positions ultimately raises deposit-insurance premiums for everyone." The key insight is that when governments show restraint in killing the zombies, they soak up capital and slash prices in a way that makes it hard for other firms to compete, thus creating more zombies. Frank Borman, an astronaut who commanded Apollo 8 and later ran Eastern Air Lines, liked to say: "Capitalism without bankruptcy is like Christianity without hell" (for example, see Time magazine, "The Growing Bankruptcy Brigade," October 18, 1982, p. 104). "Caballero, Hoshi and Kashyap (2003) explore the consequences of these subsidies for macro performance in Japan. They find that subsidies have not only kept many money-losing “zombie” firms in business, but also have depressed the creation of new businesses in the sectors where the subsidized firms are most prevalent. For instance, they show that in the construction industry, job creation has dropped sharply, while job destruction has remained relatively low. Thus, because of a lack of restructuring, the mix of firms in the economy has been distorted with inefficient firms crowding out new, more productive firms. Not only does the rise of the zombies help explain the overall slowdown in productivity, Caballero, Hoshi and Kashyap show that zombie-infested sectors have seen sharper declines in productivity growth than the sectors with fewer zombies. ... For instance, the lack of lending by the healthy banks makes sense because these banks see no point in lending to firms that will have to compete against the zombies that are kept on life support by the sick banks." But as anyone who watches television after midnight knows, despite all the warnings, zombies never actually die. Now they have been spotted in China. W. Raphael Lam, Alfred Schipke, Yuyan Tan, and Zhibo Tan have written "Resolving China’s Zombies: Tackling Debt and Raising Productivity" (IMF Working Paper WP/17/266, November 27, 2017). "Nonviable “zombie” firms have become a key concern in China. 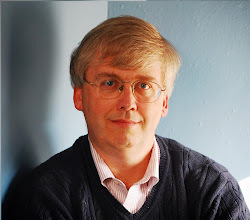 ... [T]his paper illustrates the central role of zombies and their strong linkages with state-owned enterprises (SOEs) in contributing to debt vulnerabilities and low productivity. 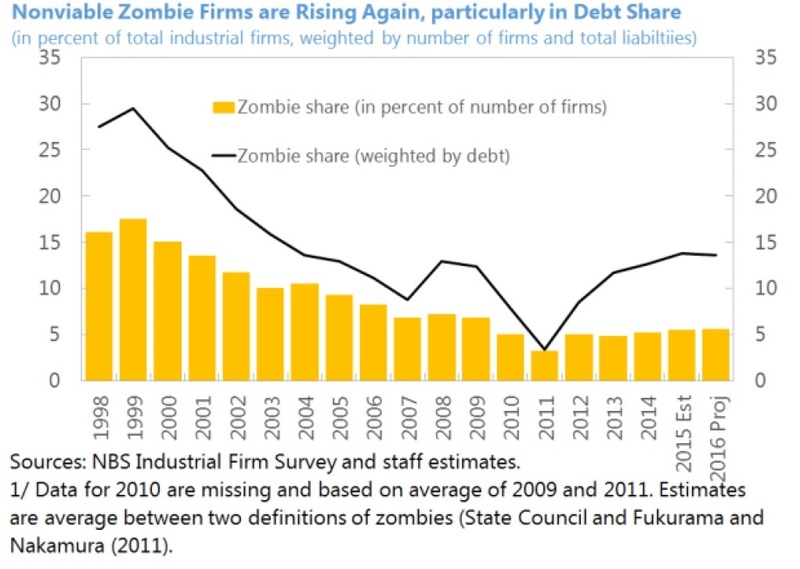 As a group, zombie firms and SOEs account for an outsized share of corporate debt, contribute to much of the rise in debt, and face weak fundamentals. Empirical results also show that resolving these weak firms can generate significant gains of 0.7–1.2 percentage points in long-term growth per year. ... While the government has introduced various reforms to facilitate deleveraging and resolve weak companies, progress has been limited. The empirical results in this paper would support the arguments that accelerating that progress requires a more holistic and coordinated strategy, which should include debt restructuring to recognize losses, fostering operational restructuring, reducing implicit support, and liquidating zombies." "There is growing recognition, however, that the productivity slowdown experienced over the past two decades is partly rooted in a rise of adjustment frictions that rein in the creative destruction process . One important dimension of this phenomenon is that firms that would typically exit or be forced to restructure in a competitive market – i.e. “zombie” firms – are increasingly lingering in a precarious state to the detriment of aggregate productivity. In this view, reviving productivity growth will partly depend on the policies that effectively facilitate the exit or restructuring of weak firms, while simultaneously coping with any social costs that arise from a heightened churning of firms and jobs. To this end, policies need to be reformed and packaged to enhance productivity growth in an inclusive fashion. "Against this background, this paper summarises the policy messages emerging from a large amount of cross-country research on Exit Policies and Productivity Growth. Main findings are reported under two main headings. First, the paper provides evidence for the conjecture that weak firms are stifling productivity growth and highlights the considerable scope for raising growth by spurring the orderly exit or restructuring of such firms. Second, it explores the potential for insolvency, financial and other reforms to revive productivity growth by addressing three inter-related sources of structural weakness in labour productivity: the survival of “zombie” firms, capital misallocation and stalling technological diffusion. Overall, the results suggest that there is much scope to revive productivity growth via reforms focused on improving the design of insolvency regimes, financial sector health and other dimensions of policy that spur corporate restructuring." For example, one working definition of "zombie" firms is that they older firms, at least 10 years of age, that cannot cover their interest payments with their profits for three consecutive years. But tinkering with this definition doesn't alter the main conclusions." The propensity for high productivity firms to expand and low productivity firms to downsize has declined over time." The prevalence of zombie firms across OECD countries has risen, and the share of capital they absorb has risen. For one more recent example, see the remarks by Claudio Borio of the Bank of International Settlements, "A blind spot in today’s macroeconomics? (at a BIS-IMF-OECD Joint Conference on “Weak productivity: the role of financial factors and policies,“ January 10–11, 2018), who discusses "the interaction between interest rates and the financial cycle and will also present some intriguing empirical regularities between the growing incidence of “zombie” firms in an economy and declining interest rates." A dynamic economy needs to be continually shape-shifting. Recognizing that zombie firms should not be nourished at the expense of other firms in the economy is a useful step in that direction.